This Soviet rifleman is firing his rifle while advancing through the snow covered field, as he and his countrymen use the advancing tank ahead of them as cover. This particular figures wears a winter coat, but you can also find in summer tunic with helmet or cap. Find him and his countrymen in the Soviet WWII Section of the Victory Store. He is one of over 1000 figures you can find in the Victory Store. 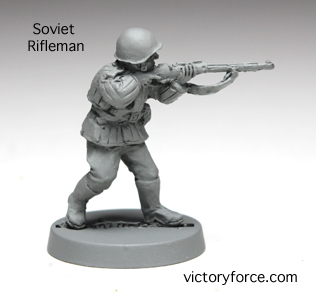 This entry was posted in Spotlight and tagged 28mm, soviets, spotlight, WWII. Bookmark the permalink.